Just came across this website that allows you to "tiltshift" photos. I had never previously heard that term, but it's pretty cool - makes things look like miniatures. My first experiment looks more blurry than miniature, I think, but it's an interesting application I will probably play with. I bet this would look really cool with a shot looking down at the Osaka skyline. I'll see if I can get on that one of these days (I have to drag myself all the way to the Umeda Sky Building for that). 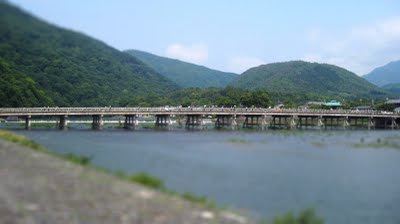 Tiltshifted bridge in southern Kyoto.